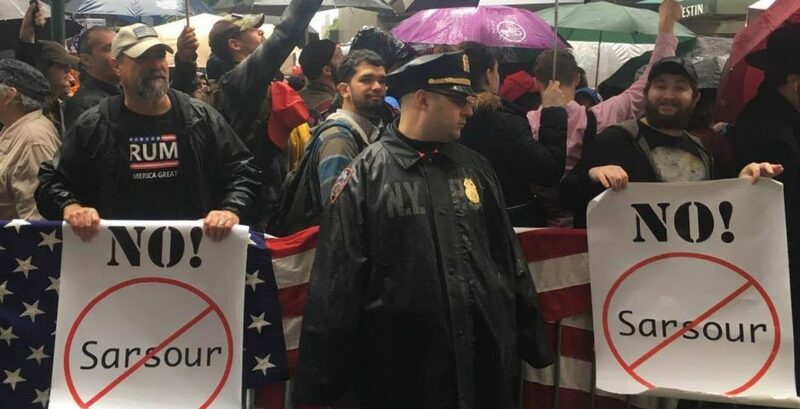 A group of far-right figureheads gathered this afternoon in Midtown Manhattan for a protest against Muslim activist Linda Sarsour. The sidewalks leading up to the event were hectic, as supporters and protesters attempted to make their way to the event. 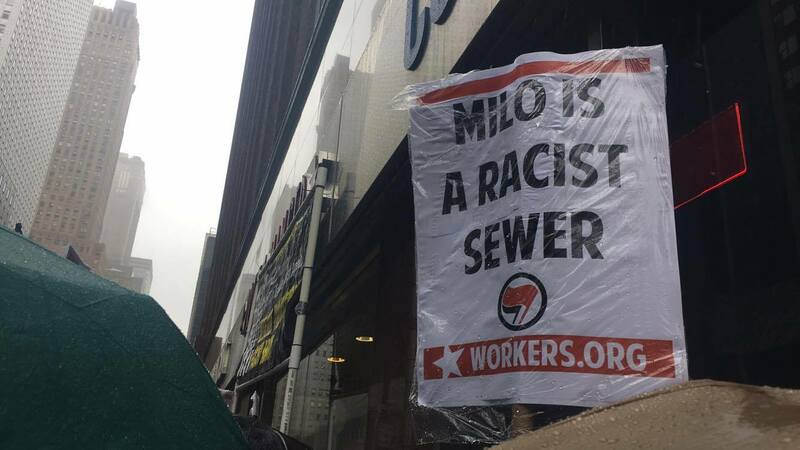 Chants of “Milo and your internet trolls, we’re gonna stop your fascist goals” could be heard from opponents, and around 500 people curved around the block. From young people to baby boomers, Make America Great Again hats decorated the crowd. 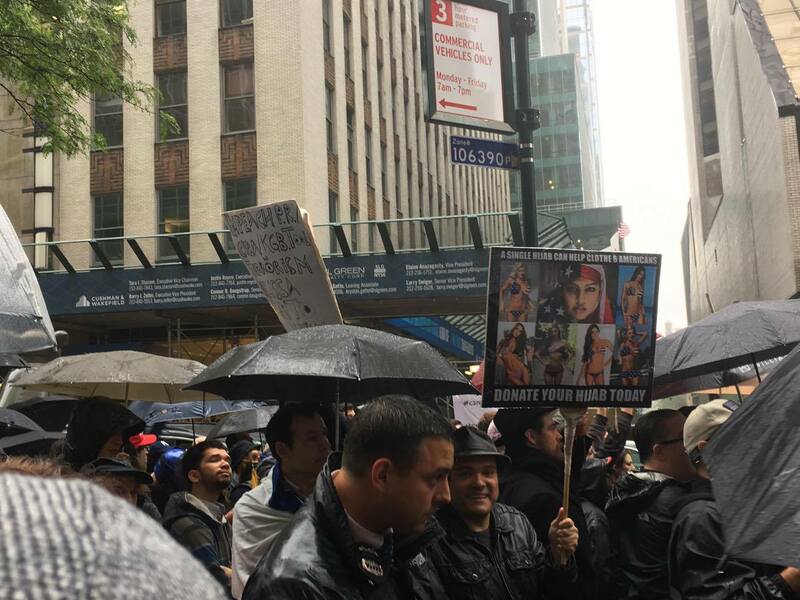 The speakers, including Assemblyman Dov Hiking, Milo Yiannopoulos and Pamela Geller, gathered in the rain on the back of a pick-up truck to address the audience. “We speak for the girls who wear the hijab and are forced to,” she told her audience. Assemblyman Dov Hiking was up next, calling the decision for Sarsour as CUNY’s commencement speaker “outrageous.” Hiking then yelled “Shame on CUNY” for allowing her to spake. “Shame on CUNY” was the chant that rang out after. A young, bearded man started chanting the word “shame,” Game of Thrones style continuously across the center aisle. Members of Bearcats, a white supremacist group, were in the crowd – three of them clad in helmets, dressed like soldiers. Speaker Lauri Regan expressed disgust over CUNY “supporting Jew hatred,” while Assemblyman Dov Hiking asked why CUNY would have a commencement speaker “who supports terrorism openly.” Noni Darwish asked: “How can they represent the future of our children in America” if Sarsour supports Sharia (as they alleged). Protesters started to thin out before Milo, who most of them were there for, showed up to the event. Milo then entered, and the crowd got what they’ve been waiting for. He wore sunglasses in the rain and a silk floral bomber jacket. “What is this weather about? Maybe God is Muslim after all,” he said to applause.